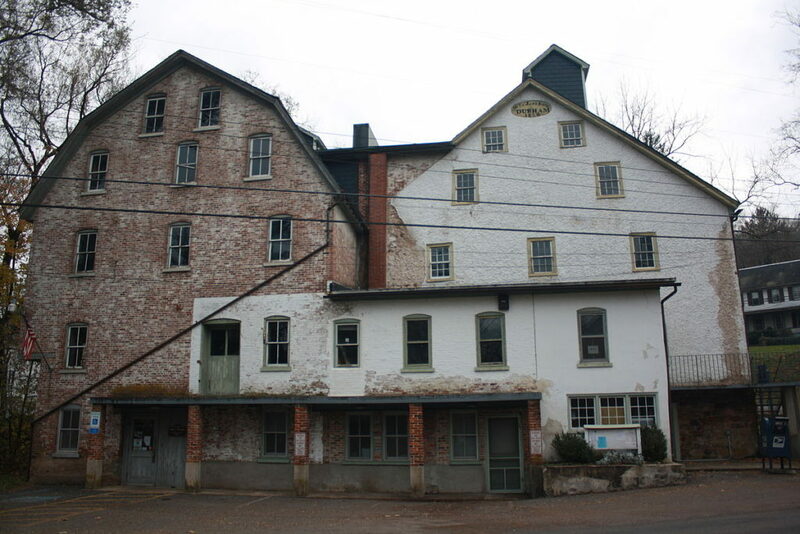 The gristmill was built on the foundation of the Durham Furnace in 1820. 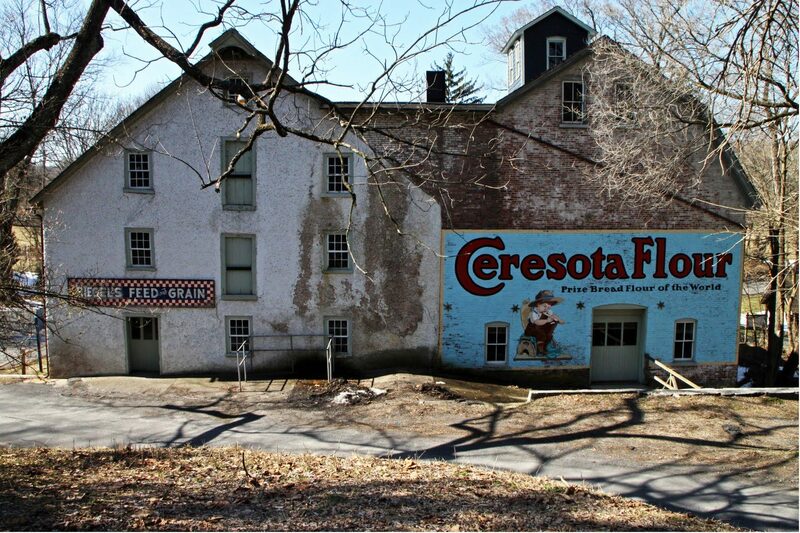 “Grandfather Riegel had a large grist mill in Durham, PA. In the basement of the mill was a huge water wheel. This wheel was powered by water flowing over its paddles from the race across the street. I could look through a screened window and watch the wheel as it went around and around on its endless journey. I was fascinated by this wheel. It made me spellbound to watch and listen. The water flowing over the wheel made an eerie sound as it fell back into the dark waterway below. The continual motion of the wheel kept a cool breeze coming from the window, with a dank, musty aura. Upstairs in the mill were the various sized mill stones. These stones ground the flour and feed. Dad didn’t allow me in the mill very often. It was an extremely dangerous place for children to be. When I was permitted to enter the mill, I had to be very careful. Chutes crisscrossed throughout the mill. Some you could squeeze past, others were so low if you forgot to duck your head, a nasty goose egg would result. A massive system of belts and gears powered by the water wheel made the huge stones roll around and around. Underneath these huge heavy rolling stones, corn, millet, oats, rye, barley and grandfather’s Special Winter Wheat were ground. As varieties of grains were crushed, a delightful pleasant aroma shrouded the mill. Wet molasses was the best fragrance of all as it was added to the cow feed. Grandfather’s flour was always in demand. He sold his flour to customers locally, and as far away as Philadelphia and New York City. You could travel for miles and miles and everyone knew of its excellent quality. Grandfather’s flour was bagged in white paper sacks, with a piece of twine tying the bag shut. The front of the bag carried a picture of a young boy slicing a piece of homemade bread. Grandfather had this same huge advertising logo on the front of his mill. The young boy was sitting on a three-legged stool. He had on a big yellow straw hat and a pair of blue overalls with one strap unbuttoned. He had a bread knife in his hand ready to slice a piece of homemade bread. I loved to watch for this painting to come into view as we approached Durham and grandfather’s mill.